Heel pain is most often caused by plantar fasciitis, a condition that is sometimes also called heel spur syndrome when a spur is present. Heel pain may also be due to other causes, such as a stress fracture, tendonitis, arthritis, nerve irritation, or, rarely, a cyst. Because there are several potential causes, it is important to have heel pain properly diagnosed. Dr. Ravaei will need to examine you and possibly x-ray your feet or use other modalities to determine the underlying source of your heel pain. 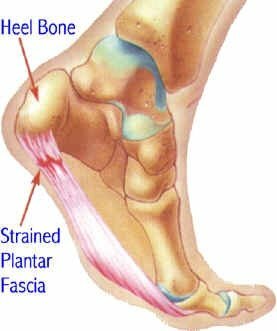 Plantar fasciitis is an inflammation of the band of tissue (the plantar fascia) that extends from the heel to the toes. In this condition, the fascia first becomes irritated and then inflamed, resulting in heel pain. Quite frequently Dr. Ravaei will see some spurring or as medically termed osteophytes at the heel bone. It should be known that this spur is not the cause of the pain and it does not need to be removed to alleviate the pain. The most common cause of plantar fasciitis relates to faulty structure of the foot. For example, people who have problems with their arches, either overly flat feet or high-arched feet, are more prone to developing plantar fasciitis. The reason that many people with flat feet have heel pain is usually due to the fact that they do not have any support for their feet and thus cause an inflammation due to the over use of the plantar fascia. Most people who have heel pain due to inflammation have more pain when they walk barefoot and they have less pain with certain shoes, specially shoes with some heels. Wearing non-supportive footwear on hard, flat surfaces puts abnormal strain on the plantar fascia and can also lead to plantar fasciitis. This is particularly evident when one’s job requires long hours on the feet. Obesity may also contribute to plantar fasciitis. Many women who become pregnant will notice an exacerbation or initiation of heel pain possibly due to weight gain. It should be noted that heel pain is also present in athletes, this as well might be due to an over use. People with plantar fasciitis often describe the pain as worse when they get up in the morning or after they’ve been sitting for long periods of time. Generally, these individuals describe their pain as an aching pain. After a few minutes of walking the pain decreases, because walking stretches the fascia. For some people the pain subsides but returns after spending long periods of time on their feet. To arrive at a diagnosis, Dr. Ravaei will obtain your medical history and examine your foot. Throughout this process he will rule out all the possible causes for your heel pain other than plantar fasciitis. In addition, diagnostic imaging studies such as x-rays or other imaging modalities may be used to distinguish the different types of heel pain. Sometimes heel spurs are found in patients with plantar fasciitis, but these are rarely a source of pain. When they are present, the condition may be diagnosed as plantar fasciitis/heel spur syndrome. Should all these modalities fail, Dr. Ravaei might use some other methods to control the pain. This could involve Electro Shock Wave Therapy (ESWT), surgery or other treatments. Dr. Ravaei will discuss these different treatment methods at the proper time and with your help devises a plan that suits your life style. No matter what kind of treatment you undergo for plantar fasciitis, the underlying causes that led to this condition may remain. Therefore, you will need to continue with preventive measures. Wearing supportive shoes, stretching, and using custom orthotic devices are the mainstay of long-term treatment for plantar fasciitis.